Photograph of Karttikeya on the façade of the sanctuary, of the Lingaraja Temple at Bhubaneshwar, from the Archaeological Survey of India Collections, taken by Poorno Chander Mukherji in c.1892. The Lingaraja temple complex, with its numerous subsidiary shrines, is the largest and most important of the temples of Bhubaneswar. It was built in the late 11th Century in the characteristic Nagara style of Orissa. The temple consists of a sanctum towered by a curvilinear superstructure, called rekha deul, divided into vertical bands and capped by an amalaka and a pot finial. The 55m tower dominates the landscape. The sanctuary walls are divided into two storeys by a triple tier of mouldings with numerous projections decorated with sculpted niches with Hindu deities, graceful maidens and the recesses with rearing beasts. Shiva is venerated in the temple in a massive linga form. In front of the sanctuary are the jagmohana (pillared porch), nata mandir (dancing hall) and bhoga-mandapa (hall of offerings), covered by pyramidal roofs. The latter two were added after the sanctuary and the porch. 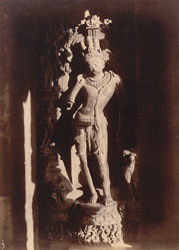 This view shows Karttikeya, the god of war and son of Shiva and Parvati, with his peacock mount.